RNR Fort View Towers is a perfect home for ones looking for space, comfort and a touch of bliss. Built by RNR Developers over a wide area, this residential development is set in Hyderabad. These homes are just few minutes away from all your essential utilities and the rest of the city. They offer 2BHK and 3BHK apartments with luxurious touch and modern amenities. Where is RNR Fort View Towers located? Attapur, a prime residential locality for house seekers in Hyderabad. What is the area of apartments in RNR Fort View Towers? The area of apartments offered in the project ranges from 1000.0 sqft to 1635.0 sqft. 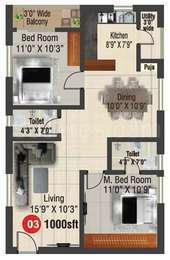 What is the 2 bedroom size in RNR Fort View Towers? 2 BHK units in the project are available in a size of 1000.0 sqft to 1230.0 sqft. What is the 3 bedroom size in RNR Fort View Towers? The area of 3BHK units in the project varies from 1430.0 sqft to 1635.0 sqft. How much is the total size of RNR Fort View Towers?The project is spread over an area of 2.0 Acres. What is the price of 3 bhk in RNR Fort View Towers? 3 BHK units in the project are available at a price tag of Rs. 6435000 to Rs. 7357500. RNR Developers is a construction company based in Hyderabad. It has a team of highly motivated and dedicated professionals and experienced civil engineers. The company believes in following ethical practices in the business and gives utmost importance to customer delight. With a collaboration of brilliant minds and skilled team, they are achieving milestones at every step. Focusing on dedication and precision, they have maintained their integrity and transparency in all terms.